Recently I have been asked by a Five Arts Forum member to comment on her south facing house located in an odd shape block of land at the end of a long street. 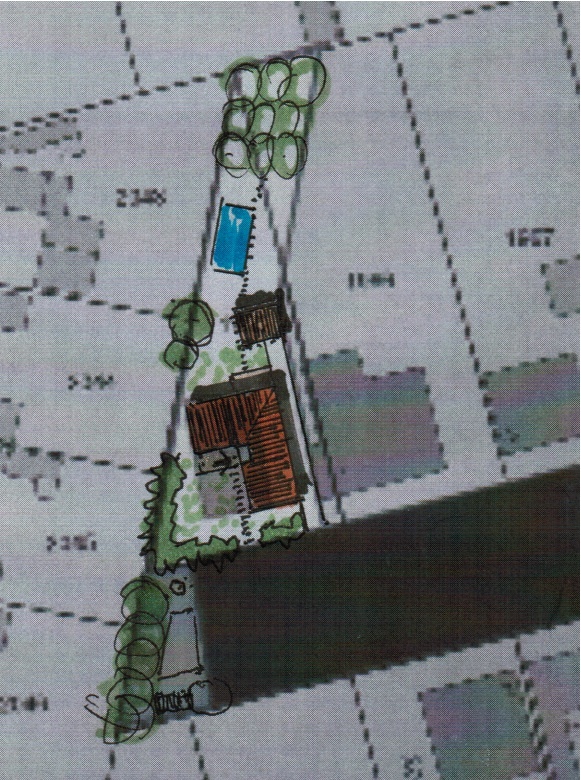 In the site plan showed below the yellow shade is her land, the green shade is an unattended space at the end of the street which she can do up and the red shade is her proposed house. The intention is to build a rectangular shape house with the front door squeezed between her large neighbor’s house to the East. By simply simply considering the open space available and the movement of the sun, giving a desirable Mingtang to the house, it is obvious that a L-shape house using the neighbor’s house to the East as the “mountain” and the street as the “water” would best suited to the context of the site. The forum member do not have enough posts to view the attachments so I am using this blog to show her a possible alternative in siting her house with a shape that is more suitable to the land. Flying Stars-wise, it has a "double stars arriving at the sitting palace" pattern, so a swimming pool, which her husband wants, at the back would be suitable in this case, and she can also have an orchard beyond the pool to energize the back of the site to make the odd shape work. Entering from the sunny side after passing the sun trenched garden, instead of sqeezing between two buildings, would greatly enhance the Feng Shui opf the Na-qi mouths and the experience of entering and leaving a house. Another advantage is now she can also make use of the two timely Sheng Qi 9 Water and Mountain stars, so it is not only practically efficient but ritually correct. FSA I cannot thank you enough for your time and effort invested in my case! Love your idea and my first impression when my husband and I went to see our architect for the first time was that the house should be oriented the way you suggest, I insissted on it, but urban planing institution did not give us a permission to do it. Every house on the street is facing east, to the neighbour’s house back. The only thing left to do is to build a projection in the sector where the main entrance is located and add space to the entrance hall and add another main door in this projection facing the street. Most people on the street have done that, on smaller or larger scale. Unfortunatelly, our plot is smaller than the others, so we can add smaller entrance hall and are more squeezed in with our neighbour. But at least, with a shifted door facing we do not look directly to the neighbouring building and have direct sunlight at least half the day. Everything else (but the house) you propose is managable and on track with what I had in mind. I was thinking to plant some flowers and maybe some shrubbs along the wall of the neighbour’s house, add some potted plants along the path to the doorstep and plant a lavender patch in front of the house’s facade to make coming to the main door and leaving the house a more pleasent experience. So the first thing one sees coming from the street will be lavender patch, than the path bordered with flowers and finally main door, mostly glass, seethrough to entrance with flourishing potted plants. It is a compromise, but I hope it might work. Thank you again for all your help. Wish you good luck in your life and all the best in everything you do! Just for my learning understand, in this south sector, is the water star = 7. My understand is mountain star on the left and water star on the right, But the problem i have is when i place the flying star onto a plan, should i turn the flying star chart to suit the facing or turn the site plan to suit the flying star. This example, if we make a 180degree turn both the plan and flying star chart, then we have 9 on the left and 7 on the right. Can please enlighten me on this? Thank you for dropping by. The convention is to assign the Water or the Facing Star to the right and the Mountain or the Sitting Star to the left, no matter whether we trun the plan or the chart or both. 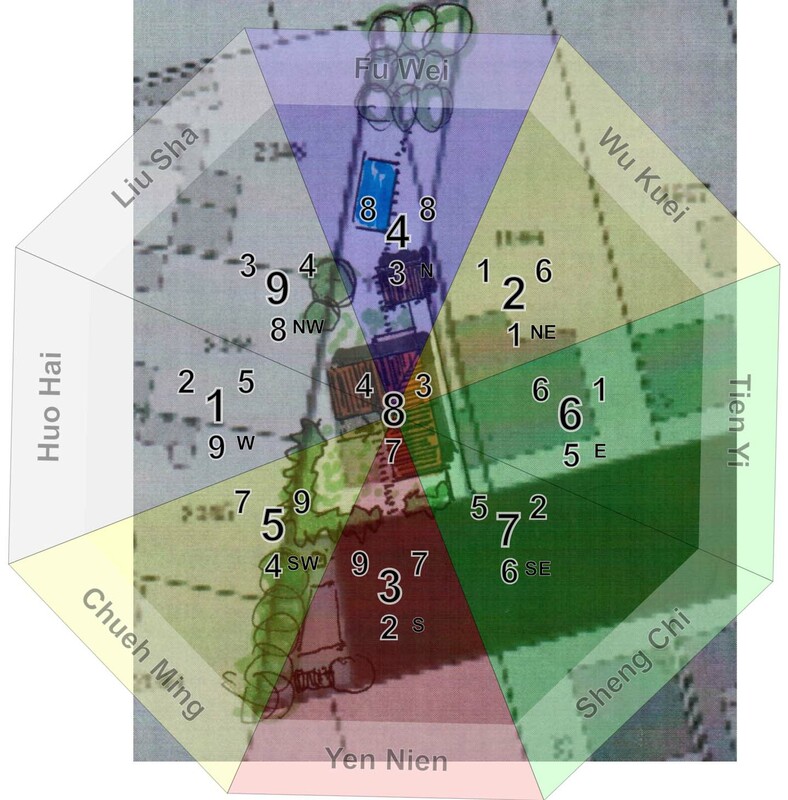 In the South or the Li palace of the attached chart, 9 is the Mountain Star and 7 is the Water Star, hope this helps to clarify. I cannot thank you enough, love your advice and tips. I have asked my Designer to do the interior design in the same way as discussed in your post.